Tarun Jasani’s new play is a historical re-imagining, inspired by the real-life experiences of Gauhar Jaan, one of India’s most renowned singing and dancing sensations. The story, interwoven with scandal, intrigue and invention, follows the journey of engineer Fredrick Gaisberg as he makes his way across India to record her beautiful voice. India, Oct 1902. Fred Gaisberg is travelling across the country capturing the exotic sounds of the East to be played on his miraculous new machine, the gramophone. He is hoping to record the beautiful voice of Gauhar Jaan, a young courtesan famed not only for her musical prowess but her arrogance. Set against the backdrop of the Mughul courts, this multilingual production explores India’s recording history at the dawn of the 20th century and touches on the wider themes of inequality, self-belief and empowerment. Gauhar Jaan was a ground-breaking female, outspoken and open-minded. During a period in history when most musicians resisted being recorded, she fearlessly led the way, despite becoming a focus of rumour and small talk. A talented singer who only ever craved control over her own fate, Gauhar’s bold contribution to world music and the revolutionary impact of technology, changed the arts and culture a hundred years ago. This new play will be showcased from 10th- 29th April 2018, at the Omnibus Theatre in Clapham, South London. The play will be accompanied by an exhibition : The First Indian Diva - The Courtesan and the Recording Industry. The exhibition is supported by the British Library and EMI Archive Trust, offers visitors the opportunity to delve deeper into the era, the life of Gauhar Jaan and to understand the revolutionary impact that technology had on the development of arts, culture together with the importance of the first recorded sound. 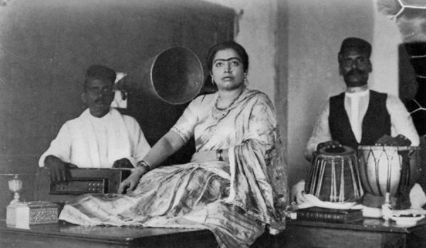 The exhibition addresses the role of female courtesans, the significance of musicians such as Gauhar Jaan and early music labels, featuring original recordings and archive material on public display for the first time.